Let me start this by saying, “Praise God our trials are only temporary!” In the scope of eternity, whatever we are currently dealing with is only a small blip on the radar of eternity. That being said, in the now, we still have to deal with our issues and one of the most important things we can do while we are walking them out it is to maintain an attitude of faith. I have found out a couple of things during my walk with Christ: one, I can’t do it alone, and two, while I am praying for my circumstances to change, God is often waiting to change me through my circumstances. In Hebrews 11:1, we read, “Now faith is the substance of things hoped for, the evidence of things not seen” and the best time we have to exhibit our faith is when we are in the most difficult situations. 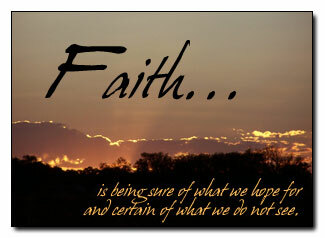 When times are tough and we realize we can’t make it on our own, that is when an attitude of faith decides our outcome. With faith, we will be on the other side, looking back rejoicing how God took us through hell on earth. Without faith, we will still be in hell wishing or hoping that someone, anyone would help us. Not only is faith vital to knowing our God, it is essential to help us in trying to understand how and why God does what He does. We will never fully understand His ways because they are so much higher than our own, but when we are confident in God and His word, despite our circumstances, there is such a peace that goes along with living. The amazing thing is that God will always do what is right and best and that confidence comes with faith. This entry was posted in Blog and tagged faith, hebrews 11 1, Hebrews 11:1, mustard seed, religion, spirituality, Step of Faith, test of faith, unwavering faith. I do believe when God sends a dove here on earth. It brings a sign of Comfort and Encouragement that it embraces the presence as I walk with Jesus day and night. I will follow him wherever he leads me to. In all things work together for his good. He lights up every single piece of puzzle which is resolve back where it came from it. I do believe the burden of the enemy has bend down, so we are forgiven in his name. The Holy Spirit always penetrate the light from the celestial heavens which fades the darkness away. I understand How God is marvelous in many ways. Iam glad he his son Jesus who died on the cross for my sins. That everyday he makes me his instrument.